The Commonwealth of the Bahamas is an English-speaking country which is located on an archipelago of around 2,700 islands in the Atlantic Ocean, just of the Southeast tip of Florida, USA, and just to North of Cuba. 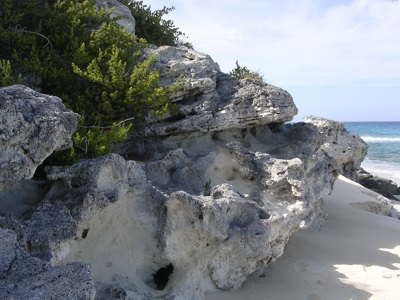 Many of the islands which make up the Bahamas are known as cays, these low-lying islands which are formed from coral. As well as Cuba and the US, the Bahamas also border the Turks and Caicos Islands. 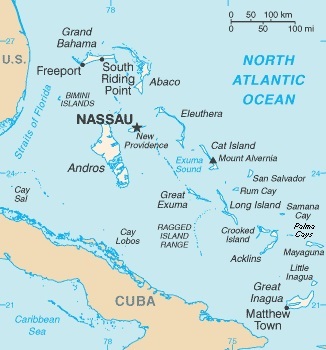 Around 323,000 people live in the Bahamas, of which, about two thirds, live on New Providence Island, which contains the country's capital and largest city, Nassau. About half of the rest, that is to say around 50,000 people, live on Grand Bahama, which is the location of the second largest city Freeport. The other cities in the Bahamas, such as Andros Town, Arthur's Town, Clarence Town, Coopers Town, Dunmore Town, Freetown, High Rock and Marsh Harbour, all have under 10,000 inhabitants. The Bahamas are classified as an upper-middle income developing country, and the country derives around 60% of its GDP from tourism. Around 5 million tourists. mostly from the US, visit the country each year. 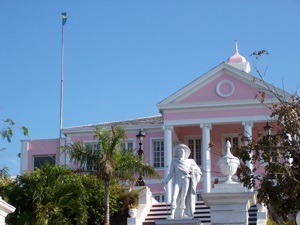 The Bahamas' second most important industry is financial services (about 15% of GDP), The Bahamas government has also tried to encourage the growth of agriculture and manufacturing, but with relatively little success so far, and has also looked to developing e-commerce as an important part of the national economy. The Bahamas uses the Bahamian dollar as its national currency, and the government maintains parity between Bahamian dollars and US dollars. As a result, businesses in the islands are generally happy to accept both US and Bahamian dollars, and often even keep a stock of US dollars available for giving change to American tourists. There are many reasons to visit the Bahamas, including most famously, the island's beautiful beaches. Visitors to the Bahamas can also enjoy a range of different water sports available, go SCUBA diving or snorkeling, enjoy sport fishing, and, of course, enjoy dry-land activities such as golf and tennis. The Bahamas exists in extremes: travelers come to find both secluded beaches and vibrant parties on the sand; to dive dramatic wrecks and barrier reefs and glide in sailboats across crystal waters; to try a traditional fish fry or savor delicacies from all across the world; to stay in a cozy inn or a flashy new resort. Our travel experts help visitors navigate must-see destinations and tucked-away gems so they can escape the everyday and absorb the region’s diverse culture. Experience the real Bahamas with Moon's practical tips and local know-how. Looking for more island adventures? Check out Moon Aruba, Moon Bermuda, or Moon Jamaica. Updated annually, the Waterway Guide The Bahamas 2019 edition is the indispensable cruising companion for boaters exploring the Bahamas and the Turks and Caicos. The guide features mile-by-mile navigation information, aerial photography with marked routes, marina listings and locator charts, anchorage information and expanded "Goin' Ashore" articles on ports along the way. Helpful cruising data like GPS waypoints, detailed planning maps, distance charts and bridge tables help get cruisers there safely. Flexible spiral binding and heavy laminated covers with bookmarker flaps ensure durability and easy use in the cockpit and at the helm. Lonely Planet The Bahamas is your passport to all the most relevant and up-to-date advice on what to see, what to skip, and what hidden discoveries await you. Explore the massive barrier reef in Andros, spot a famous star or starlet strolling down Pink Sands Beach, or snorkel with color-changing octopi; all with your trusted travel companion. Get to the heart of the Bahamas and begin your journey now! The Perfect Choice: Lonely Planet The Bahamas, our most comprehensive guide to the Bahamas, is perfect for those planning to both explore the top sights and take the road less traveled. Looking for more coverage? Check out Lonely Planet's Caribbean Islands guide for a comprehensive look at what the whole region has to offer. Authors: Written and researched by Lonely Planet, Emily Matchar, and Tom Masters. Insider advice on avoiding the crowds as you hit all the best beaches, resorts, outdoor activities, restaurants, and nightlife. We'll show you the hot diving spots, from Grand Bahama to Bimini; the most abundant fishing at Treasure Cay or the Exumas; and the best golfing on Paradise Island or New Providence. Plus tips for navigating the less-traveled corners of the Bahamas, from San Salvador in the south to the Abacos in the north. Where to find the best rock lobster on Harbour Island, the hottest clubs on Cable Beach, or the best family getaways on Great Exuma. Insightful commentary on honeymooning, touring the Bahamas' national parks, or just sailing around. Opinionated reviews. No bland descriptions and lukewarm recommendations. Our expert writers are passionate about their destinations--they tell it like it is in an engaging and helpful way. Exact prices listed for every establishment and activity--no other guides offer such detailed, candid reviews of hotels and restaurants. We include the very best, but also emphasize moderately priced choices for real people. User-friendly features including star ratings and special icons to point readers to great finds, excellent values, insider tips, best bets for kids, special moments, and overrated experiences.